If you want your child to develop good thinking skills, here is one way that won’t work. Let's look at a typical ten-year-old boy. This boy lives in Kearny, Nebraska, and his name is Bingo Little. He is about the age to begin studying a serious textbook. Here is a picture he drew. Notice two things in this picture. First, Bingo’s head is rather small. This is because his head has yet to be filled with useful knowledge. Second, he is smiling. 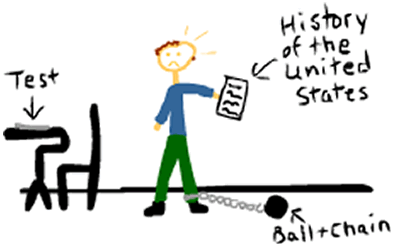 Six months later, after he had completed a history textbook, with tests, Bingo drew another picture. Notice how the upper left of his cranium has enlarged. This part of the brain contains the ability to memorize things for a short period – say, a week (just long enough for a test). This part of Bingo’s brain is now highly developed, and is temporarily filled with such facts as “The United States purchased Louisiana from the French in 1803” and “In 1793 Eli Whitney invented the cotton gin.” However, this makes Bingo lopsided, occasionally causing him to lose his balance. The rest of Bingo’s head remains the same size that it was. When a student spends time studying textbooks or memorizing facts – such as the periodic table of elements or all the counties in Nebraska – he is only using one part of his brain. 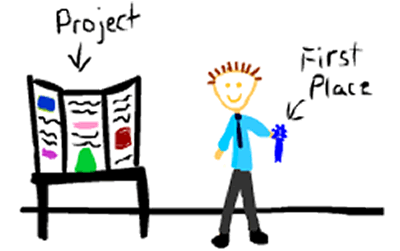 However, if that same student enters an educational contest, such as a science fair or a history fair, he is going to have to use his entirebrain. Consequently, his entire brain will get bigger. 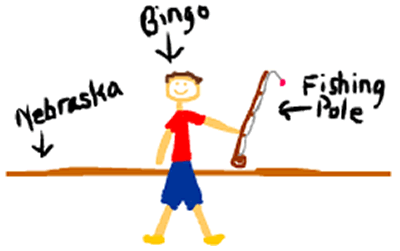 Let’s look at a picture Bingo drew after he won first place at a science fair. Notice how his whole brain has swelled to such an extent that his hair stands on end. Doing a science fair project caused his entire brain to develop at an even rate. At age ten, the logic lobe is a small but growing part of Bingo’s brain, so it needs work. A good idea for Bingo would be to create a history fair project on something controversial, such as the Civil War or the J.F.K. assassination. He could study all sides of the issue and decide which he thought made sense. Then he could create a display on the issue telling what he thought. This would teach Bingo how to use critical thinking skills to evaluate controversial topics. If you asked Bingo to spell Australopithecus in a test, do you think he would remember how to spell it years later? But imagine he is writing an essay for the Midwest Creation Fellowship Student Essay Contest on “The Great Ape Man Hoax of the Twentieth Century” and a key term is Australopithecus. He wants to win, so he makes sure it is spelled right. The spelling of Australopithecus isn’t thrown in the miscellaneous-knowledge-bin; it is filed in the remember–this-drawer. When we were ten, we saw no purpose in doing anything that (1) wasn’t fun or (2) didn’t make money. This was because the largest part of our brain – called the most-important- lobe–was the part that processed these things. If you chained Bingo to a desk to fill out workbook sheets, which lobe do you think would be stimulated? Not the passion-for-inquiry lobe. More like the prisoner-of–war-section. However, entering a contest has the potential of winning. And what happens when you win? Fame! . . . Glory! . . . Power! . . . Prize money! These things motivate us. What motivates your kids? If Bingo decides to write the Australopithecus paper, he will need to be interesting and persuasive; that takes creativity. Most projects require creativity. Or, let’s say Bingo enters the “Young Inventors Awards Program” (put on by the National Science Teachers Association and Craftsman tools). The object of the contest is to invent or modify a tool. Not only does he need to come up with the idea, but he also needs to develop and improve it. Since this is a hands-on project, he will be exercising his moving-little-fingers-lobe. The object of the National History Day Competition is to “make history come alive in an exhibit, documentary, paper, or performance.” If Bingo got stuck with a project on “Anastasia: The Lost Daughter of the Czar,” he might not be excited at first – “it’s about a girl!” However, once he realizes that he can use this to study the Russian Revolution, which was a war, his passion-for-inquiry-lobe will light up. While this is a very small part of Bingo’s brain, often referred to as the back-forty-lobe it is important. Everything has a deadline, and Bingo’s project isn’t different. To get the job done on time, Bingo needs to be disciplined enough to organize his time, gather materials, and read books. If he is motivated by visions of winning first place, the back-forty-lobe suddenly gets attention. Start small and get big. Don’t begin by entering your ten-year-old in the defense department’s competition to design an aircraft carrier. You want him to actually accomplish something. If you start too big, he might get discouraged. Start with something simple such as a history fair project on Queen Elizabeth or Attila the Hun. Find the kind of project which motivates. If our mom had pushed us into entering the national spelling bee, not only would we have placed 873rd and 874th, but we would have come away with bad memories. This is because we will never be good spellers. Likewise, a quilting contest (while an exhilaration for our sisters) would have completely failed to spark out interest. We need something that motivates us. The key to a successful contest is to find out what motivates your student, what he is good at, and what he is interested in. Find out that, and you are on your way. First appeared in Homeschooling Today magazine, July-August 2004.